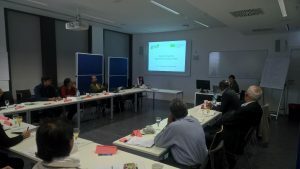 Frankfurt, October 28 (BASUG): The Centre for International Migration and Development (CIM), a cooperation of the German development agency GIZ and the International Placement Service (ZAV) of the German Federal Employment Agency (BA), organized a daylong networking workshop for the Indian diaspora organizations in Frankfurt University on 28 October. Project Manager of the CIM Programme “Migration for Development”Olivia Hannemann, Program Coordinator of CIM in India Richa Arora and Failiou Gueye from ZAV presented different funding options and programs for the returning experts from Germany for the sake of development projects in India and other developing countries in Asia. During their presentation, it was appreciated that the project application procedure to CIM has been much simplified and also possible in English language. BASUG project with the title Clean Clothes: Safety and Health Compliances for Garments Workers in Bangladesh was presented as an example of best practices. With the support of CIM it has been implemented in Germany and Bangladesh. 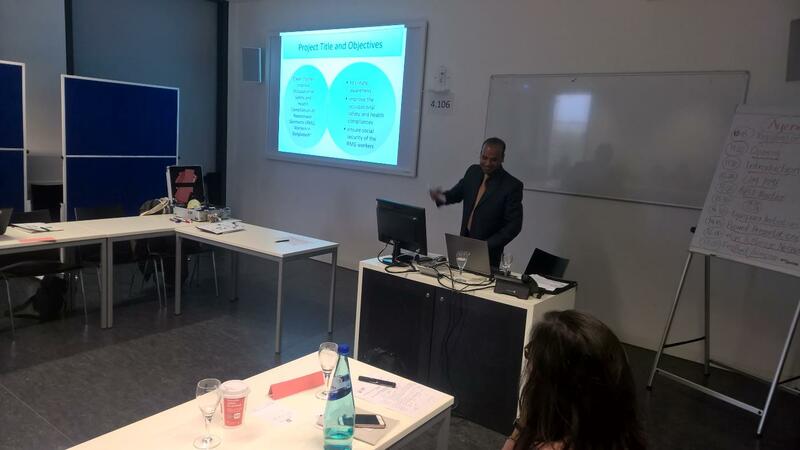 BASUG Project Coordinator in Germany AHM Abdul Hai presented it including project objectives, target audience, project activities, financial plan and management, communication materials and documentation methods. It also comprises the challenges and opportunities to achieve the expected results and outcomes. About 20 representatives from different Indian Diaspora organizations active in different cities in Germany took part in the workshop. They also presented their own organizations and projects for the better understanding of the trends and methodical approaches of development projects in the southern countries. The workshop also included better networking opportunities among the stakeholders and potential partner organizations for further cooperation and joint projects specially targeted for the socio-economic development in the Indian states. Founding President of the Indus Entrepreneurs (TiE) Ashutosh Kumar delivered a presentation on How to manage networks. Among others, Chairman of AMIKAL Anjana Singh and AMIKAL Organiser Dilek Aksu, President of Hanseatic India Forum e.V. Dr Amal Mukhopadhyay, Founder President of Gandhi Kinderhilfe Bad Camberg e.V. Dr H.C.B.N. Roy, Jubin Shah from Heidelberg Indian Students’ Association (HISA), Dr. Subramanian Saravanan, Suhas Patel from TiE Deutschland e.V., Rukmani Ganesan from Indian-German Association Ingolstadt e.V. and Jayashankar Selvadurai from Indian Association Hannover e.V. (IASH) presented their project activities in the sessions.